It truly is like a light switch when all the fun times and simply relaxing at home come to an end. We pack our bags for a long overnight stay, splitting up our family, half keeping our home running with responsibilities at school and at work, the other half immersed in the world of cancer and all that comes with fighting back a disease that is so relentless. Our hospital stay was a fairly easy stay as these things go. Boring is a good word to use in this scenario- no surprises while getting the job done. Morgan is home now after a week of treatment inpatient in St Pete. Now we wait for her counts to drop, she will become neutropenic which means she won’t enjoy the ability to fight back infections like most of the rest of us. The rules have changed here over the years- she is allowed to go out into public places, open air is best, but contact with people is limited and only if we KNOW that there have been no exposures to illnesses. With all of the colds and flu going around we will probably lay low. Her platelets, which are used to stop bleeding and her hemoglobin which is used, among other things to carry oxygen through her body will fall to levels that require transfusions. She will be in and out of clinic a few times each week unless she spikes a fever. If that happens she will go back to St Pete inpatient and wait for all of her blood counts to recover. We expect the recovery to occur within a few weeks. We appreciate all of your kind words and prayers, the sweet messages and texts regarding her Jr Royalty experience. She truly loves the Florida Strawberry Festival and enjoyed sharing in it over the past year. Thank you also for the prayers and well wishes for her health. We hope this next month will continue to be boring and that she will recover quickly and without issue. I have a confession to make: I didn’t want my daughter to win. Before you get upset with me, please give me a chance to explain. We spent weeks looking for the perfect dress. Not too big, not too revealing, just the right color. Then came the shoes. Good for walking, proper height to make her taller, not matching but coordinating with the dress. The spray tan, the manicure, the make up. Hours together, she and I some of the time, with family and friends the other times. Shopping and looking and talking. Making memories. We practiced. She had always practiced but this year was different. She is older and wanted to step up her level of preparedness and really feel the confidence all the way from her dress to her make up to her walk. She worked on facials and pauses. She worked on walking and speaking. We always encourage memories and friendships made. That is not the easiest thing to have in a fast paced school environment. It is also not easy when you spend days upon days and sometimes weeks upon weeks in the hospital, disconnected from every day life with girls her age. It is a challenge to make and keep friends. This Pageant brings a unique opportunity where girls from different schools and different neighborhoods can be together, nervous and excited with a common goal. Competition here is stiff but you wouldn’t know it backstage. She talks about what friends she saw and who she sat next to, how they touch up lipstick, fix each other’s dresses. All of these girls are in competition but they support and lift up one another in the best way. At least that’s how she feels about it. For a girl who doesn’t really do pageants, this one means a lot. She has competed four times in this pageant. Her second competition was 2 days after finishing chemo. Her fourth competition was the night before a 7am flight to NYC for scans to track her cancer. She tries to live as normal a life as possible and when the time comes to deal with cancer, she deals. Then turns ‘normal’ life back on as soon as she can. Pageant season is such a fun time of year, a time when I can pamper her just like every other girl, we can do what the other girls do and share the kind of experiences and memories that the other girls share with their moms. The night of the pageant, the moment they called number 100 for top ten, I almost fell to the floor. She worked so hard. She walked so beautifully. Floated across the stage. Radiated confidence on a stage in front of hundreds of people and WITH NO HAIR. I couldn’t have been more proud or more excited for my girl to get what I felt she deserved. A top ten. If you make top ten, you get to answer a question onstage. We worked on her answer, practicing and practicing: she has hearing loss and sometimes loses a consonant or runs words together when speaking. She made her answer her own, she thought long and hard about whether to bring up the elephant in the room. She doesn’t want any special exceptions for her situation, she wants so desperately for that part of her life, the cancer part of her life to be hidden. But she cares SO MUCH that so many kids are fighting cancer, and she has lost SO MANY friends to cancer that she decided to speak about them if she had the chance to speak on that stage. And she did. And she nailed it. Fast forward to the top five…..number 100 was called and I started getting nervous……is this real? What is she thinking right now? Is she enjoying the moment and letting all the emotions, excitement, fear, gratefulness and love run through her? Or is she worried she was called back because: SHE HAS NO HAIR. It’s something we talked about a lot in the months preparing for this one special night. We know people think it. We know people notice. You can’t see a bald child and not think about cancer. It’s the only thing that bothers her about going bald. Everyone knows. She is different. She knew when she entered the contest that she may be starting more chemo and she may lose her hair. I asked her in November if she was bald during the pageant, would she want a wig? A head wrap? She thought about it for just a minute and said, I want to be brave like Natalie (another local cancer fighter) and go as I am. If I have no hair, that is how I will walk the stage. She knew she could handle whatever came her way. I wish I was as smart and as brave as her. So, as the emcee went through announcing the runners up and the first maid, my nervous mind was filled with the anxiety of all that could go wrong. Will she be able to handle all the events, the standing and walking, will she be off treatment for the fun stuff, what happens if she misses an event, will it break her heart? Would potentially negative words and reactions of others (thinking she received special treatment) torment her? I didn’t want her to win. I couldn’t bear another heartbreak for my child. She has had too many in her short fifteen years. Goodness, I was in for a shock! Number 100, Morgan Pierce, called the winner of the pageant. My girl, who withstood more pain, more fire, more hurdles, more heartache than any child or adult for that matter should ever know, much less endure. She won. And goodness, she showed me. She took this blessing with grace, head held high, only hearing kind words and happy thoughts. Honored to be chosen and represent. Excited to share a year with new friends. She deserves this as much as any other girl. And she earned it. She knows that. I know that. This year brought many friendships, and many, many happy days representing the festival that she has loved all her life. A festival that loves her right back. She has had the opportunity to grow in public speaking, the chance to meet new people, see old friends. She has sister queens for life, special girls who mean the world to us. I wouldn’t trade one moment of the past Junior Royalty year and consider myself fortunate to be given the opportunity to learn from this amazing experience. Morgan winning this Pageant has taught me to live in the moment. Being yourself and working hard towards a goal are the rewards. It doesn’t matter what others think, it’s what you think of yourself. I’ve learned to let the other stuff go and enjoy today for what it brings. No, I didn’t want her to win. But I am so thrilled she did. Life is what you make it even when bumps appear in the road.Morgan sailed through recovery from November’s chemo infusion. She had many clinic visits and several blood and platelet transfusions along with rest, rest and more rest. We traveled to NYC early December for scans, her doctors are happy with the results and want her to continue with more chemo. It seems this chemo regimen is etching away at some of the neuroblastoma; the scans read as slightly improved. We were given the doctor’s blessing to go on a cruise we had been planning since the summer, to Key West and Cuba and to attend the Florida Strawberry Festival Junior Royalty competition where she will crown the new queen! The year ended with good news and happiness. It started with another slight bump in the road: on our cruise, Morgan developed a swollen ankle, seeming to stem from a sprain from climbing the numerous stairs on the ship which then developed into cellulitis. This caused a high fever which earned us a trip to the ER for blood cultures and antibiotics. We had to disembark at our first stop, in Key West to get her to the local ER where they checked counts and administered IV antibiotics. Unfortunately the fever came about an hour before the boat was to leave port- the boat waits for no one-and they left for Cuba without us. Fortunately, Morgan’s counts were good so once the ER doc released her we rented a car and drove to Port Everglades to pick up our car and head home. All of this transpired in about 15 hours time; we made it home at 6am Thursday. We are sad about the missed trip we had been planning for months but we are glad Morgan’s injury is improving. We truly can’t make this up. Once home we decided to spend some family time in Orlando as consolation for missing our Cuba trip. And we are so thankful for friends that are more like family and the time we did get to spend with them, if only for 2 short days. We appreciate the days we have together and the days we have out of the hospital with each other. Life is certainly what you make it. It’s up to you how you choose to live, we are doing our best to make the best out of a not so fun situation. The last ten years have taught us the importance of appreciating and living life to the fullest. Morgan will start chemo again mid-January and we hope and pray that it continues to etch away at the disease in her bones. She feels well, is taking it easy on her ankle and looking forward to what comes next. Sleeping in our own beds is such a luxury, we have been spoiled to be at home for much of the last month. I savor all the every day tasks that I had been accustomed to complaining over. I relish the opportunity to cook dinner and put the dishes away. I am grateful to clean the floors and straighten couch pillows. Morgan goes off to school most every day, the sheer joy in this, the chance to watch her come and go every school day as if life were normal is a blessing not lost on me, for now. I know I will become complacent if given the chance to continue this unremarkable routine but in reality it is actually, remarkable. The fact that parents of special needs kids know we could at a moments notice be shuffled back into the realm of doctors and nurses, clinical trials and iv medicines, tears and pleas of why, keeps us grateful, for a time. The lining, albeit not silver, hanging on the edge is that of fear and dread for the immense hardships she must face. Early November brought more hospital days and treatment. Thankfully, Morgan tolerated it well although she has to work extra to keep up with exercise and nutrition. She is tired and not hungry but she gets up and moves and eats, even cooking for herself to stimulate hunger. We are home for now, watching for fevers and hoping and praying to stay out of inpatient for the next few weeks. we will see. Scans will be mid-December. After a long weekend of reflection in what seemed like an empty city over Labor Day weekend, Morgan got to work. She had a temporary line placed in her chest to attempt to pull stem cells from her blood. Days of prep went into this attempted collection with morning shots and evening shots and other wellness tricks to increase Morgan’s levels of stem cells. We did this collection thing back when cancer was new to us, when Morgan was 6 or 7 years old. She collected 3 ‘rescues’ at that time and in the last 8 years we have used them all. When she was very sick in the spring, we used her last available rescue to boost her immunity while she was fighting cancer AND a fungal infection in her lungs. It saved her life. Since we were out of cells, this new collection was very important. After having the line placed we reported to the blood donor room every morning, hooking her up to a pheresis machine to pull any stem cells that were floating around in her blood stream. The body is an amazing thing, we continually make these stem cells and they grow into things like platelets and red blood and white fighter cells. It turns out, Morgan’s body is just as amazing. All the hard work and effort paid off: over 10 million stem cells were collected- that is 4 rescues! We needed this great news after such a tough blow the week before. Stem cells are the equivalent to money in the bank and for Morgan it means she has more options for treatment.The collection isn’t easy and Morgan is fatigued and a little underweight from the stress. Thankfully we sailed into a really fun and really meaningful weekend with great friends. We put in some hard work but made the best memories at the 8th Annual Super Slugger Softball Tournament in Gulf Shores. It’s the flagship event for Jensen’s Heart of Gold Foundation and we have been blessed to attend every year. It was a struggle to get there as our flight from NY to Atlanta was delayed which left us about 20 minutes to get to our connector flight in the enormity which is Atlanta airport. With no wheelchair in sight Morgan and I quickly jogged to the next concourse only to find the doors closed to our plane and it slowly backing away from the gate. We were devastated. All this work put in to get the job done in NY and now we were watching our ride to a fun weekend pull away without us. That’s when we found Stanley with Delta. He quickly realized the situation and within 15 minutes had our plane turned around to come back and get us. Thank you, Stanley for taking care of my girl. We made it to Gulf Shores and had a great weekend with fantastic friends. Our fun couldn’t last forever, though, we came home and then directly to All Children’s to start treatment. Even as mad as Morgan was to hear of her progression it was always her plan to get started on treatment. She’s been inpatient all week, fighting cancer again. Missing school and football games and sleeping in her own bed at night. There is an end to this and the benefits outweigh the hardships. We are praying to get home this weekend for a little time to sleep and relax before she is back inpatient again for recovery. The blood donor who gave in order for the pheresis machine to be primed for Morgan’s use. The Upper East Side friends who bought her dinner when she was feeling low after scans. The nurses and doctors who consoled her when she was in pain. Stanley from Delta who got her where she needed to go. Friends to share laughs with and just hang out with when she needed a break. Money for the extra gas for her Dad and sister to come back and forth to the hospital from work and home. These are simple things that even as a cancer family we take for granted. Small moments and little treats mean the world during a rough day or week. You can help give these little things to families with a child fighting cancer by donating in Morgan’s honor to Jensen’s Heart of Gold Foundation. Even better, you can buy a table to our Gold Gala (held in February) and see Morgan and chat with her about helping other kids with cancer! Whatever you choose to do please try to make a difference in your circle this September for Childhood Cancer Awareness Month. Thank you for following along on this journey! We appreciate every prayer, message and wish that you send. In the almost ten years that Morgan has been fighting cancer we have learned so much. More than we want to know, really. About our healthcare system and it’s limits, about the resiliency of kids, compassion, love and the shear will to fight. I have lost count of the number of relapses or progressions Morgan has experienced in her time fighting cancer. She has suffered yet another this week. She feels great which is why it is unexpected. Disease has reappeared in many spots, too many to count. She feels great. Her blood counts and other factors that help indicate relapse are within normal ranges. The only reason we know she has disease is from her scan. All else looks good. I take a small comfort in that. She’ll move forward with attempting to collect stem cells in NYC and then do some sort of treatment, probably at home. If you take anything from this post, please let it be this: Morgan is no different from thousands of kids facing the same issues every day. She should be worried about school and having time to be with friends. She should be arguing with me about what to wear to the football game and how late she is allowed to stay out. She can’t. And she is not alone. The BEST thing you can do for Morgan is to GIVE. GIVE your time and volunteer to raise money. GIVE your time and volunteer at the hospital. GIVE your time by screaming from the rooftops: kids with cancer are suffering and they need ALL OF US TO HELP. Morgan wants other kids to have opportunities to make memories. Enjoying a lemonade seems like a simple thing: sweet and refreshing, it’s the best summer treat, especially when you can’t have breakfast and soon have to hold off on fluids. At least every three months since Morgan was diagnosed with cancer, she has endured a full workup of scans to keep an eye on disease and general health. Each time she does this she has anesthesia which requires she not eat after midnight and only clear liquids for a short time in the morning. It sounds easy but I will tell you, it is not! As her parents, we don’t want to eat or drink when she cannot, so we all end up starving and thirsty by the afternoon! This morning she had a request for her favorite lemonade drink. 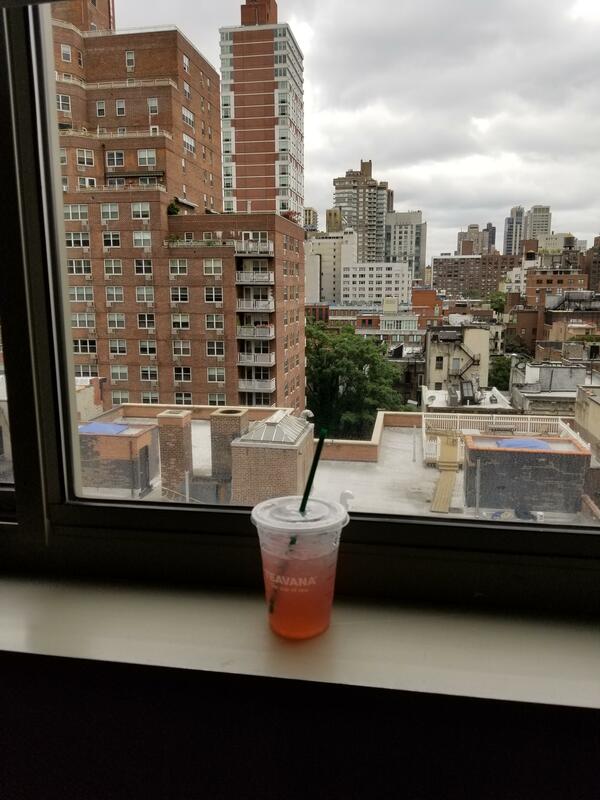 The procedure room nurses couldn’t approve this lemonade as a ‘clear liquid’ without seeing it, so this morning’s chore was to pick it up, take it to the hospital, show it to the doctor and finally gain approval to enjoy it early this morning at the Ronald before she starts her day. This week and next Morgan is scanning and then collecting her own stem cells to bank for future use. We need as many stem cells as we can get, hoping and praying for millions in the collection! Saturday starts Childhood cancer Awareness Month. Please remember kids like Morgan go through days like today every day. Every day. They wait in hospital and clinic waiting rooms and hold food and drink to undergo grueling procedures. Surgery and chemotherapy are daily topics. Please remember these kids are just kids and that is all they want to be. When Morgan was diagnosed at 5 years old we asked her what she would wish for if she could have anything in the world and she said this: to go to school and be with her friends. We couldn’t give her that, still can’t at times but we can give these kids a chance at making memories and living life by volunteering time and donating funds. Our charity of choice is Jensen’s Heart of Gold Foundation Florida! Please choose to do something every day in September to show your support for kids with cancer. Be kind and share what you know. Sign up to volunteer or donate funds. Thanks for following along on this journey with us and for your continued prayers and support.